Have you ever seen that lots of software embeds the Babylon Toolbar into the setup installer? Do you have Babylon Translation Software installed on your computer? Do you find Babylon Search toolbar being added to your web browser abruptly? You can’t remove this application even if you have used the most powerful uninstaller? You try to get rid of it but it is still on the system after you restart computer? What Is Babylon Toolbar? Is It A Scam or Legit? Babylon was supposed to be a helpful desktop translator providing translation and language learning solutions before, but it has become a piece of questionable software in the past few years due to the fiercely competitive market. Supported by Babylon Software Ltd established in 1997 Babylon Toolbar, Babylon Toolbar was known as a promising translation product that offers a variety of language solutions and provides translations in over 77 languages. After it attempted to hijack the user’s system by adding its toolbar forcibly, changing the user’s browser preferences such as the home page and search engine, it falls to the category of browser hijacker now. Microsoft antivirus defined this application as adware (detected as “Adware: Win32/Babylon”) because of its potentially intrusive behavior. For example, every time the user try to open the browser, they will immediately get redirected to isearch.babylon.com or Search.babylon.com, not the home page that they have set. Or when you try to get to Google or other common search provider to search something, your browser will redirect to Babylon Search. Such fake search engine will display fraudulent search results that are designed to direct the victim to malicious websites that contain advertisements designed to install Trojans, adware, spyware or cause other malware problems. Technically Babylon toolbar is not a virus, but it does have a lot of malicious traits, such as rootkit capabilities to hook deep into the operating system, browser hijacking, and in general just interfering with the user experience. Even this software is legitimate, the Babylon Toolbar has received an incredibly bad reputation and it is a malicious search engine today. How Did I Get the Babylon Toolbar? The Babylon Toolbar may be bundled with other free software that you download from unsafe websites. Any of the programs you get from the Internet can install this malicious browser toolbar. What’s even more likely is that you installed some other application which came with the Babylon search bar and you didn’t notice when it got installed as you failed to uncheck it as an optional ride-along during the install process of something you actually wanted. Besides, some applications distributed on CNET’s download.com have Babylon Toolbar bundled in, for example. When installed, it hooks itself into Windows, Internet Explorer, Firefox and Chrome, making it difficult to remove. Needless to say, it is pretty evil for this famous download site to do such thing without informing its users. All computer users should always keep their eyes wide open when downloading and installing software from anywhere on the Internet. It is very common for the download sites and adware developer to put third party software as an already-selected ‘optional’ extra and such option must be deselected. 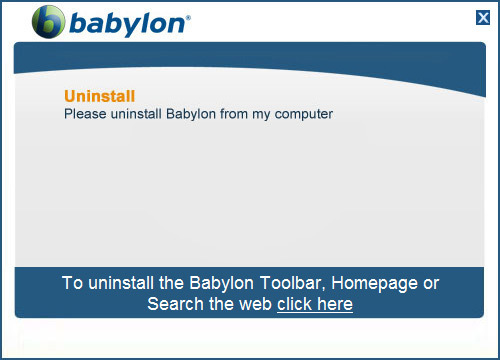 If you want to remove the Babylon toolbar, the first thing you will need to do is make sure that the program is not running, so you need to uninstall its client from your computer first. Once you have exited out of Babylon, click on the Start Menu, the windows icon usually located on the bottom of the page. 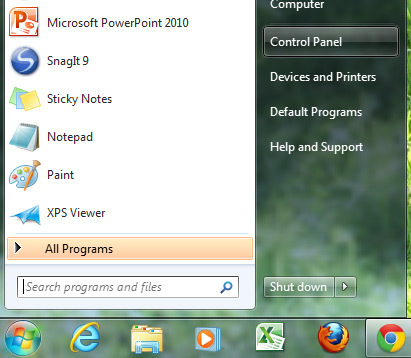 Click once on Control Panel, which is located on the right hand side of the Start Menu. Locate Babylon in the list of installed applications and click on Uninstall. Follow the uninstall wizard to uninstall Babylon from your computer step by step. After that you can start cleaning the Infected web browsers. Open your Chrome browser, click on “Customize and Control Google Chrome” button at the top right corner of the window. From the drop down list you need to select “Settings“. In the page of Settings, find the option of “Open a specific page or set of pages.” and click on Set pages. In the following pop-up box, you will see the page of Babylon taking up your startpage. Delete the link of it and then enter the URL of the site you want to use as your startpage. In the same Settings page, find the Appearance section. You will see that http://isearch.babylon.com/ has been set as your homepage. In the box of “Open this page” enter a new web address to replace the unwanted website and Click on OK to save your changes. In the page of Settings, under the Search section click on Manage search engines…. If Babylon is your current default search engine, make Google or the other reliable search engine as default and then you can delete the malicious search engine from your browser. Click on Done to save the change you have made. Right click on the icon of Chrome, and then select Properties. The browser hijacker will modify the Target field so it will be able to redirect you to its page no matter when you start the browser. As such, you need to delete the malicious URL in the target field. To fix this problem, simply delete the URL that comes after .exe”. Running an effective antivirus program like SpyHunter is another necessary step for removing Babylon Search infection. While most antivirus programs can find several types of malware, particularly viruses and Trojans which can stay hidden on your PC indefinitely, this tool has been widely used by many computer users to remove malware like unwanted programs and adware. It simple to use while it has a huge virus database to remove all known computer threats. Some questionable websites offering free downloads could be laden with malware like Babylon Toolbar browser hijacker and dangerous PC virus. Clicking the download button can be quite tricky because you can only see one small download button while the rest parts are uncertain. You may be tricked into downloading adware and the system can be bombarded with tricky advertisements if you are unlucky. Firewall is one of the helpful software which completely keeps the good stuff in and the bad stuff out. It helps to block any type of threats and hackers from accessing the system. Freeware can be harmful as it refers to free programs or software that is downloaded from unknown websites. This can be harmful because lots of malicious programs are bundled with these free software which is not seen and gets installed into the system. Always try to install an anti-virus software which is good for system and run it on your computer. Installing antivirus software is not enough but actually required is good software that can protect your system from any type of threats. This entry was posted in Adware and tagged babylon toolbar virus, remove babylon search, uninstall babylon search toolbar. Bookmark the permalink.